This is a fairly handy trick. I’m always logging in to different servers, which all have a different location for their logs. With this trick you can login and just type “cd logs” from anywhere. Awesome, we’ve arrived in our logs directory straight from our homedir! This Bash Here would open that directory in Cygwin (mintty). My current PC is fairly regulated, so without admin rights and thus I can’t use the CHere option which I would normally use. I just created the registry keys via regedit and that works fine. Save the file and double click on it to import it to the registry. 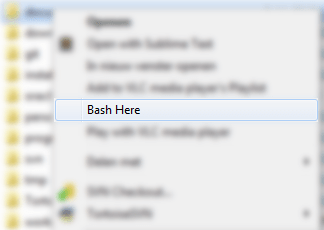 Inside bashhere double click on the standard key and insert text “Bash here” without quotes (This is the text which is displayed in the context menu. Both options will create a context menu item which opens Cygwin at your current windows directory! This message occurs every time you start your freshly installed Cygwin when you’re logged in as a domain user. Important: You need to install Cygwin with the user you are logged in with. mkpasswd -l only shows my local users, and not the domain user I’m logged in with, so that does not solve this. mkpasswd -l -d get an enormous amount of users because it tries to replicate my whole organisation, which is not necessary. After that, our current account is added to both /etc/passwd and /etc/group and the annoying greeting message is gone!